Welcome to Open Link Night everyone! This is Gayle from Bodhirose’s Blog and I’ll be your host for today. The U.S. is well into fall now and I know many temperatures are beginning to drop, the trees are bursting into their fall colors and it’s also a popular time for many fall festivals and art shows around the country. In my home town of Orlando, the surrounding attractions have many special shows and programs at this time of year mostly geared towards children and upcoming Halloween. Another large draw in nearby Daytona Beach is Biketoberfest where motorcycle enthusiasts come from across the country and beyond to share their love of motorcycling and racing at the Daytona International Speedway. I spent many a year at this gathering as my (ex) husband was an avid motorcyclist and participant in some of the amateur races with his friends. There’s definitely been a palpable change in the weather here of late. The humidity has dropped as well as several degrees of heat during our days. Such a welcome relief! Perhaps we should add some hot apple cider to our pub drink offerings as we get things off to a start. As most of you know, Open Link Night signifies choosing any ONE poem of your choice to link up and share. I want to extend a personal welcome to any newcomers and I eagerly look forward to enjoying your writings. Click on Mr. Linky and enter your name where indicated, copy the URL of your poem and enter it into the space provided and then click “Enter.” There you will find links to all the other poets. Others will join during the next 48 hours so check back for more reading. Read and comment on other poet’s work, we all come here to have our poems read and to be acknowledged. Promote the poetry that you enjoy on the social media of your choice. The train ride sounds wonderful and Boston is probably in full fall colors by now. Doughnuts sound wonderful, Lill…coming right up! I live an hour away from Orlando. The mornings have been cooler and the afternoons pleasantly warm. And I now live about an hour away myself, Brian, in Sebastian on the east coast. I have noticed less humidity here lately and I hear we’re supposed to have a “cold” front come this weekend! We’re about 2 and 1/2 hours apart then. We do get cold on occasion during the winter. It’s been several years since we dropped below freezing though. The coldest morning here since 2000was 16 degrees and it did snow briefly in 2009. I moved south to be warm! So glad you are getting some relief from the heat and humidity. It’s turned cold here. The tomato plants are withering and I still have work to do to clean out the garden and prepare it for cold (it was 28 F yesterday morning). Need to get working on a poem for today, too. I’ll take one of those hot apple ciders in the meantime, if you please. Wow, Victoria, it is cold there already! Hot cider coming up. So nice to see you here tonight, Xenia and it’s my pleasure to be your host today! hi Gayle, thank you for telling us a bit about autumn in the States. I like the sound of warm apple cider, but I have a liking for pear and fruit cider – there’s one from Scandinavia called Rekorderlig that’s one of my favourites, but I’ve never tried it warm! I’m afraid my poem is rather sombre this evening – sorry to darken the light mood. Ahh, but you have never had freshly pressed apple cider that has not been processed, ice cold! Up north they nake doughnuts from the fresh cider that are to die for. Toni, I’ve never tasted doughnuts made from apple cider but I have no doubt that they must be heavenly! They are a new england delicacy…yeast raised and deep fried with a glaze of apple cider in addition to the cider in the dough. Go to New England Magazine.com and pull up several recipes. I know I would love them! Pear and fruit cider sounds wonderful, Kim. I only buy fresh pressed apple cider during the year and drink it cold. Having it warm during the cool months with maybe a stick of cinnamon slowly simmered with it is really tasty! Hi Gayle! The weather has barely changed here in Atlanta. Still hot today, but tomorrow it will be in the high 60’s…Yahoo! Perhaps the real Fall is on the way? Some trees are showing their colors, the dogwoods and a few others,but overall, it’s still green out there. 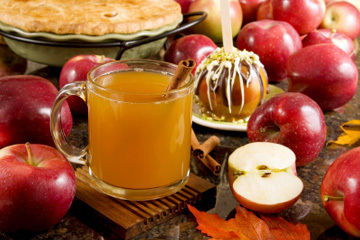 Apple Cider is my favorite drink…hot or cold. Posting a rather somber love poem. Waiting to read what others have posted. It;’s good that it’s not 1000’s here. How would one ever get through? D’verse as it stands is a great site. Hi Jane! I think the cold front that is due here this weekend is maybe hitting you first in Atlanta. It pretty much stays green here year round unless we do have a hard freeze and then things will turn brown. I look forward to reading your somber love poem. 🙂 And I so agree, dVerse is a great site…thanks for joining with us you’re presence is much appreciated. Here the weather has turned cold. Below 10C every day, but that makes bicycling less sweaty. I will not have time to read tonight, just home from a business dinner, but will try to read tomorrow morning. Hi Bjorn…thanks for coming by. Yes, I would imagine your cooler temperatures make your bicycling much more comfortable. See you tomorrow then…have a good evening! Hello all, Happy Fall! It’s 93 degrees here with 6% humidity. This is how Southern California feels in fall. I love it. Happy Fall, Mosk! Southern California sounds like it has pretty perfect weather year round…I’ve yet to visit there. I believe I would love it too. I’m glad that you are, Toni…and you’re welcome! Forgive my tardiness to the pub…was late with the wee lass today! Welcome everyone! Taking a break for dinner and will return to read and comment later. Nice to see you, Grace! I really enjoyed your amazing list of secrets…so creative! Hi Kay, I would think that Ohio would be chilling down by now. We did have a bit of a cooler morning today and expect our lows to be in the 60s for at least the next few days. With the hot, hot summer we’ve had this will feel amazing! So glad you came by today…and it’s my pleasure to host for you! Usually it is, but the past few years we’ve had some warm fronts come though around this time. The weather goes from 50-60, to the 80’s, and back! You could be speaking about our winters…although our days will mostly be in the 70s. If we have a cold front come through it only lasts a day or two and then we warm right back up. We really can’t complain, that’s why so many northerners call Florida their winter home. And enjoy the cool weather! I love fall. Hot apple cider coming up, erbiage. Yes, I would think that the bright yellow of the daffodil is different than those waning leaves. Thanks for joining us! Although officially our spring it’s been cloudy, with rain and cold evenings. So a warm apple cider sounds just great. A favourite here is gluhwein – warm red wine with a dash of cinnamon. Hi Petru…always nice to have your presence here with us. Hot apple cider coming up…it should help warm you up from your chilly evening. I’ve never heard of gluhwein…thanks for sharing. We who live so far away from one another can learn much about each others cultures and habits. Was somehow unable to leave Uttley a comment so will leave it here in hopes he sees it: I’ve never heard of this form before…so very interesting with the repetitive last line. I really enjoyed your poem and hope that we all find love that stays with us. Thanks so much for joining with us at dVerse.